A couple weeks ago, we wrote about how to double-protect a zip file by encrypting the contents, mostly because password-protected zip files are very easy to crack. 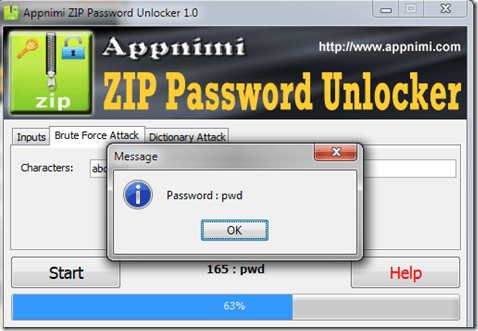 If you have the opposite problem, and you need to crack a zip file’s password quickly, Appnimi’s Zip Password Unlocker solves the problem almost instantly. After a quick download, unzip the program and install the AppmimiZipPasswordUnlockerSetup file. When the program opens, select the zip file. Next, choose a destination for the contents of the zip file to extract once the password is cracked. Choose the minimum and maximum number of characters for the password. In most cases, passwords are 4-20 characters long. Only the truly dedicated choose a password more than 20 characters. The more characters required, the longer it will take to crack the file. Depending on the complexity of the password, this may take several minutes. Files will extract when the password is found. Zip Password Unlocker also offers two customizable crack options. The first, Brute Attack, uses specified characters in random order until the file is cracked. Once cracked, the password appears on the screen. The other option, Dictionary Attack, gives users the ability to use a specified text file with long lists of words to crack the file. This is useful if you know the person who protected the file probably used a specific word, rather than a number/word combination. Windows machines lost built-in ability to lock Zip files with Windows 7, but there are still third-party applications like 7-Zip that still allow the ability. We were able to quickly crack a 7-Zip protected file in less than 5 minutes with Zip Password Unlocker.